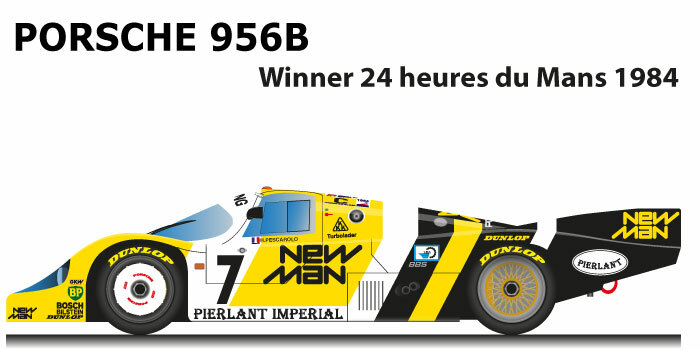 The Porsche 956B n.7 is the winning car of the 24 Hours of Le Mans of 1984. After the two consecutive victories with the 956 of 1982 and 1983 the official Porsche team to protest with the ACO decides not to participate in the Le Mans due of the regulation on consumption, the house in Stuttgart thus left the chance to win the private teams that had the reliable 956. Ludwig, and Pescarolo won the 24 Hours of Le Mans in 1984 with the Porsche 956B n.7 of the Joest Racing team, in second place the 956 n.26 of the Preston Henn team with a gap of one lap, third the 956B n.33 of the John Fitzpatrick Racing team. The race was conditioned by the death of the race commissioner Jacky Loiseau due to the incident involving John Sheldon’s Nimrod-Aston Martin and Drake Olson’s sister car.